Trees you can fit in your pocket and Daisies the size of mountains. One of the major features of Terragen 2 is its ability to import externally created objects such as buildings or trees. There are many sources for 3D models that can be used directly or converted for use be Terragen. Many users have been kind enough to make models in Terragen's native .tgo format freely available. Create an object, tree or building etc. using Wings 3D or Blender, export it from either as an .obj and Terragen will import it at the scale it was created at. Both Wings 3D and Blender use an arbitrary unit, which when imported directly to Terragen translates as one unit equals one metre. However if an .obj created using Wings is loaded into Blender and resaved Terragen will then import it at one tenth of its original size. Load the Grid appropriate to the size of the object being tested. Add the object to the scene. 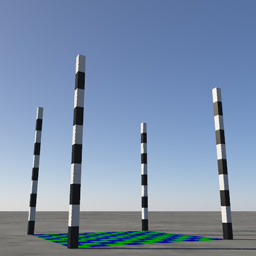 Compare the object to the grid to ascertain whether scaling within Terragen is necessary. 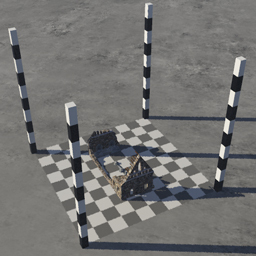 The imported object can be scaled and the test scene rendered again until the correct scale factor is found. 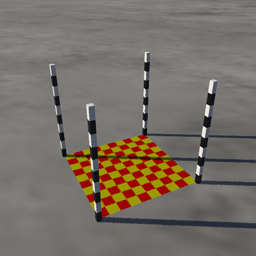 I have provided grids at various scales: 10cm, 1m, 10m and 100m along with the Marker Post object (.tgo format). 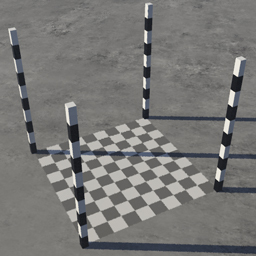 The grids are procedurally generated using functions therefore no texture maps are requited. All of the grids are centred at the origin and the cameras are placed 1.7m above the ground to give a realistic eye line. The 100m grid also includes an aerial camera. 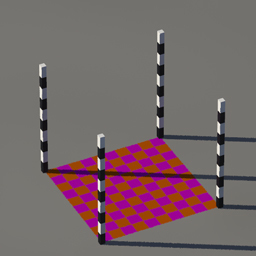 For the 1 metre grid the grid squares and marker post stripes are I0cm, the marker posts are 1m high and are placed at the corners plus and minus 0.5m from the X and Z axes and are 4cm by 4cm (width and depth). 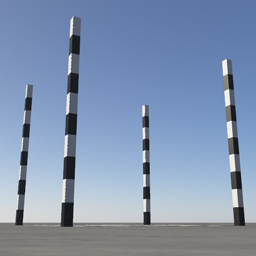 Here are several examples of the grids in use; please note that the objects being tested are not included in the download. 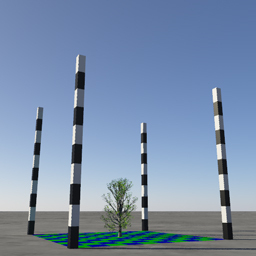 10 metre grid showing an under scaled tree; Spring Bloom Birch made by JCinBAMA and available on the Ashundar Terragen Community Here. Note that the .tgo version has been used and that several fixes have been made to the materials. 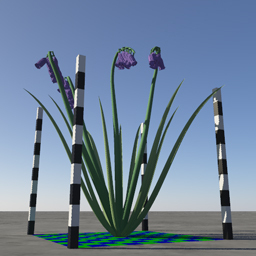 10 metre grid showing some huge Bluebells from TerrAde also available on the Ashundar Terragen Community Here. This final example shows the aerial view of the 100 metre grid with a correctly scaled ruined church, another one from The Ashundar Terragen Community Here. This time by Ogre; showing that it never harms to check the scale of an object before using it in a scene.